Flash back to 4th grade art class. “Today we are going to decorate for winter and will be making snowflakes,” your favorite art teacher says. As excitement fills the air, you and your friends rush to get paper and scissors to begin your masterpieces. After making your final cuts to the paper, you open your paper to reveal a unique snowflake that you created. Did you ever wonder why your snowflake looked different than the rest? Or better yet, how real snowflakes have unique shapes and patterns when formed in the atmosphere? 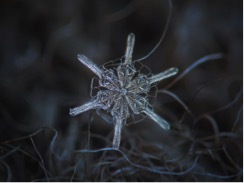 The science behind snowflakes has to do with chemistry. There are many different types of ice that develop in the atmosphere ranging from sleet, to hail, to snow. The difference in these types of precipitation results from the formation of the precipitation in the atmosphere. Hail develops in thunderstorm clouds because of temperature changes when ice crystals move upwards in the cloud (known as updrafts). It is quite possible to encounter a hail storm in the middle of summer! Sleet forms if snow passes through a warm layer of air followed by a cooler layer of air before reaching the ground. Freezing rain, on the other hand, forms when rain hits a surface and freezes there. Often times freezing rain results in long icicles developing on trees! Snowflakes, commonly called “snow crystals” by scientists, result from the condensing and freezing of water vapor droplets. These droplets sometimes require a base—usually in the form of a dust particle. Condensation is the process of forming liquid water from water vapor; it is responsible for the creation of clouds in the sky. After the condensation of water droplets onto the base, the water droplets freeze, forming ice. When there are many ice crystals in the air, they start to gather together, forming larger snowflakes. Once the weight of the ice crystals gets too heavy, they fall to the ground and what we see is snow. So why does snow appear white even though the ice crystals themselves are clear? Light from the sun comes in a variety of wavelengths, which we see as different colors including red, orange, yellow, green, blue, indigo, and violet. When light reflects off a surface (think of your reflection in the mirror), it reaches your eye. The reflected wavelengths are the colors that you see. Snow appears white because all of the wavelengths of light from the sun are reflected. In general, white objects are good at reflecting all the wavelengths of light, while black objects absorb, or take in, all of the light. The reason that snow appears white when there are many flakes together versus a single snowflake is because when there are many crystals together, it is able to reflect all of the light from the sun. Why are snowflakes usually six-sided? It has to do with the way that water molecules pack together to form a lattice (or structure) when they freeze to form ice. They make a six-sided, hexagonal shape and therefore six-sided snowflakes eventually form. Snowflakes have unique patterns because of the path they take when traveling through a cloud. So, the next time you are out playing in the snow, think about what kind of snowflakes are around you and how they formed in the atmosphere. While we often do not think about the science behind weather, it is responsible for the symmetry and beauty of nature around us.